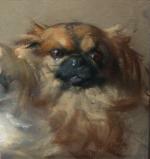 Lively painting with three Pekingese was executed c. 1900 by listed Neapolitan painter and art writer Marino Lenci (874 - 1939). He studied at the Instituto de Belle Arti in Naples and by Luigi Nono in Venice. 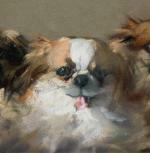 He was popular with his portraits of dogs and cats. 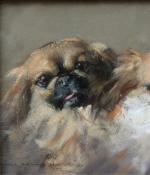 Technique: pastel on papier. Original period frame. Measurements: unframed w 11 1/4 " x h 6 1/8" (28,5 x 15,5 cm), framed w 14 1/8" x h 9" (36 x 22,8 cm).